Roy Chidiac is a lawyer at CMKZ, a firm he joined as a student in 2015. As part of his practice, Roy Chidiac works in business law, corporate and investment law. He assists Canadian and international companies operating in Canada from the moment of their creation or arrival in Canada, including the incorporation of companies, the sale and purchase of businesses, banking, the daily legal needs of businesses such as commercial leases, executives and directors’ commitments, the registration of trademarks, and the reorganization of Canadian and foreign companies. 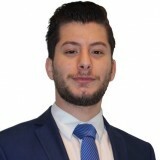 Roy Chidiac also works in immigration law, more specifically in the immigration of foreign entrepreneurs to Quebec, Canada. Through his involvement in various law firms specializing in civil law, Roy Chidiac has acquired advanced knowledge of contract law (contractual and extra-contractual civil liability).